Series 1 continues! 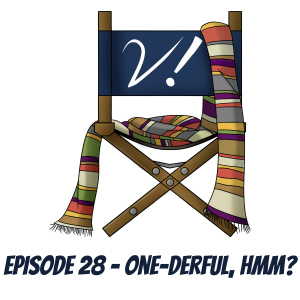 Join Deb, Erika, and Katrina as we discuss a serious Slitheen, a crowded TARDIS, immature breakups, and more! “Boom Town” tends to be a bit of a forgotten episode, so we tried to give it its due. How do you feel about this ep? Did you forget about it? Or do you find the personal drama exciting? Let us know in the comments! awaits the first ep of the new podcast she’s been working on, Doctor Who’s Line Is it Anyway?! wrote a new timey-wimey Doctor Who-Star Trek crossover fanfic, “Gene Roddenberry is Not a Timelord”! seeing Hello from the Magic Tavern live! doing a live show of The Incomparable and hanging with her Incomparable Network pals. Deb can’t wait for Long Island Doctor Who 4! As promised, for our year of firsts, we’re taking you back to the very beginning! Join Deb, Erika, Liz, and Tansy as we dive into the very very first Doctor Who story, “An Unearthly Child”. We’ve all seen the first episode more times than the latter three, but we have a surprising(?) amount of positivity about the rest of the story. Those cavemen aren’t half bad! What do you think of the Doctor’s first onscreen outing? Let us know in the comments! delights in her LEGO Dimensions fun pack (even though she doesn’t have the game itself)! anticipates a fantastic Gallifrey One! WROTE A BOOK about “The Ambassadors of Death”! adores The Diary of River Song from Big Finish! wishes a speedy recovery to Michael from the Tin Dog Podcast! giggled over Sarah Dollard’s tweets about her father watching Doctor Who! looks forward to cooking geeky treats from The Official Doctor Who Cookbook! also can’t wait for Gally–specifically a Verity! In Defense Of panel and meetup with some fun giveaways!